195/60R-15 500AB 1,235 lbs 44 psi 6/32nds N/A 0" N/A 0"
Purchase includes the Kenda Kenetica tire only. The wheel rim shown in the picture is not included. Picture provided is a stock picture from the manufacturer and may or may not reflect the actual product being ordered. 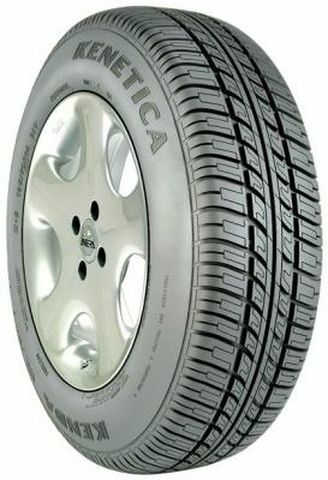 All Kenda Kenetica tires are continuously developing with manufactured improvements. With that said, Simple Tire and the manufacturers have the right to change these tire specifications at any time without notice or obligation. Please Note: Specifications of the Kenda Kenetica tires shown above are listed to be as accurate as possible based on the information provided to us by Kenda tires. I got a set of 215/70-R15 Kenda Keneticas in summer of 2017 because they were inexpensive, yet from a reputable brand known for making generally good offroad and motorcycle tires. These tires are not generally good; they are thoroughly BAD. Mine have 18,000mi on them and it's doubtful they will make it to 20k. They made noise when new, have since worn out-of-balance, and the wet traction has only gone from bad to worse. Driving on any kind of ice is downright scary. You can get a set of these installed for $260 in some areas, but they're a terrible value. If you have to replace them three times in 60k, that's equal to one $780 set of tires that last 60k. Just spend an extra $50 on tires that do that and you'll save at least $500 in the long run. Excellent tire for the money! By submitting a review, each person received a sweepstakes entry. I purchased these tires because of their low price and 65009 mike warranty. They arrived soon after the order was placed. I checked the manufacturer date and fount they were only made a few months earlier. I wanted to see if the price was so good because they were sitting around, which they were not. The tires handle very well wet or dry and I’m waiting to see how the handle with some light snow. The tires are a little louder than others I have had but not enough to care about especially being $50-$80 cheaper than a more name brand tire. I will definitely purchase again when needed By submitting a review, each person received a sweepstakes entry.